CHICAGO -- The Rogue Sport crossover is getting a face-lift this year. The 2020 Rogue Sport, revealed Thursday at the Chicago Auto Show, receives new front-end styling, updated interiors, more standard safety tech, an upgraded audio system and semi-autonomous driving technology. The Sport will be available this fall. U.S. sales of the Rogue rose 2.1 percent last year to 412,110. It is Nissan's best-selling model and the second-best-selling crossover in America. Nearly a third of Nissan vehicles sold last year were Rogues, and the model accounted for more than half of Nissan brand light trucks sold. Although the Sport is based on the same global platform as the Rogue, it is actually a different vehicle. It is slightly smaller, with a different engine, unique handling characteristics and a separate target market. "Rogue Sport fits that particular need for the people who maybe aren't quite into the family stage, but they still want a lot of the capabilities that the crossover vehicle has to offer," Nissan North America Chief Marketing Manager Scott Shirley told Automotive News. Offering two sizes of Rogues gives buyers more options. Where small cars such as the Versa and Sentra once provided an entry point to the Nissan brand, the Rogue Sport helps bring first-time buyers into the fold. Those buyers are no longer looking for bare-bones, economy cars, said Sam Fiorani, vice president of AutoForecast Solutions. "They are tech-savvy and want a high level of technology in their devices as well as their transportation," Fiorani said. "More so, they expect it in their vehicle." 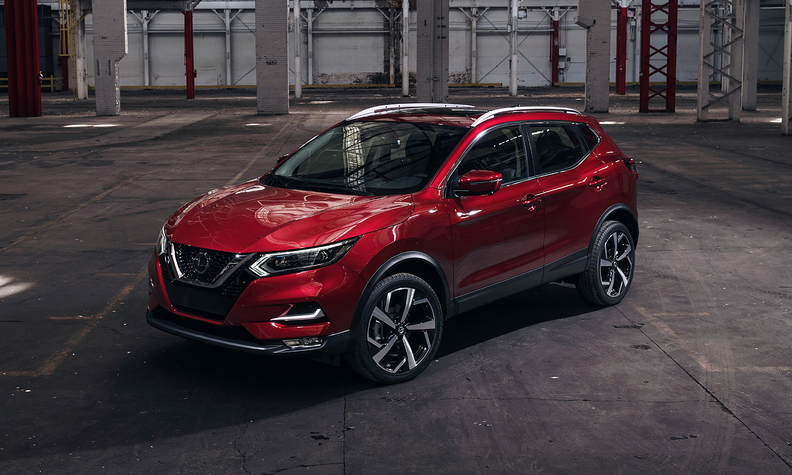 Most prominent among the 2020 Rogue Sport updates is the exterior styling, which includes new front fascia features, a new hood, Vmotion grille and bumper. The lighting treatment includes LED signature daytime running lights. Nissan's Safety Shield 360, currently offered on SV and SL grades, will become standard on all 2020 Rogue Sport models. The safety tech suite includes automatic emergency braking with pedestrian detection, rear automatic braking, lane-departure warning and blind-spot warning. Starting with the 2020 model, the Rogue Sport will offer Nissan's semi-autonomous technology as an option. ProPilot Assist is a single-lane, "hands-on" driving-assistance technology that reduces driver workload by decreasing the amount of driver acceleration, steering and braking input under certain conditions. The 2020 Rogue Sport will be powered by a 2.0-liter, four-cylinder engine that delivers 141 hp. It will be available in front-wheel- and all-wheel-drive configurations and in three variants -- S, SV and SL.